The eleventh edition of Art Dubai, which opens its doors to the public this week, promises to be the largest instalment staged to date. 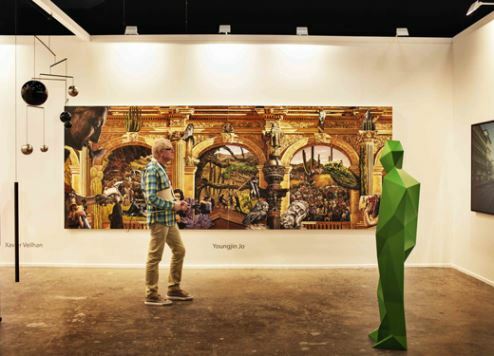 Held under the patronage of HH Sheikh Mohammed bin Rashid Al Maktoum, Vice President and Prime Minister of the UAE and Ruler of Dubai, and under the new leadership of Fair Director Myrna Ayad and International Director Pablo del Val, this year’s fair will feature a record 94 galleries from 43 countries in attendance. With 27 of these galleries attending for the first time, Art Dubai continues its mandate to offer unrivalled access to art from across the globe, reinforcing its position as one of the world’s most globally diverse art fairs as well as the preeminent platform for the regional art scene. This year, Art Dubai Contemporary will feature 79 galleries spread across its two gallery halls, including a selection of 30+ galleries focusing on solo or two-artist exhibitions. Art Dubai Modern, now in its fourth edition, will showcase museum-quality works by Modern masters from the Middle East, Africa and South Asia. Further highlights of this year’s programming include the unveiling of Rana Begum's winning work for the ninth edition of the Abraaj Group Art Prize; the eleventh edition of Art Dubai's critically-acclaimed Global Art Forum, titled Trading Places, and exploring the way trade shapes – and reshapes – the world; a Surrealist dining experience realised by Beirut-based art collective Atfal Ahdath at The Room; an interactive installation by Moroccan-born, Brooklyn-based artist Meriem Bennani at the Art Dubai Bar; a series of specially commissioned performances taking place during the fair; as well as a Modern Symposium, comprising a series of talks celebrating the cultural impact of 20th century Modern masters from the Middle East, Africa and South Asia. Art Dubai will be staged at various sites across Dubai from 15-18 March.